The story of an Aboriginal boy whose house is invaded by a Hairyman – a spirit the old people call a Quinkin. When a little green tree frog lands on his windowsill, he knows she has been sent by the ancestors to help him face his fears. There’s a bad spirit in our house. He’s as ugly as ugly gets and he stinks. You touch this kind of Hairyman and you lose your voice, or choke to death. It’s hard to sleep when a hairy wrinkly old hand might grab you in the night. And in the day you’ve got to watch yourself. It can be rough. Words come yelling at you that hurt. 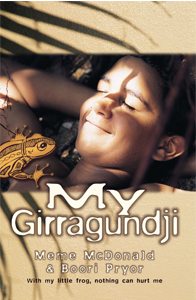 Alive with humour, My Girragundji is the vivid story of a boy growing up between two worlds. With the little green tree frog as a friend, the bullies at school don’t seem so big anymore. And Girragundji gives him the courage to face his fears. Meme McDonald is a graduate of Victoria College of the Arts Drama School. She began her career as a theatre and festival director, specialising in the creation of large-scale outdoor performance events. Since then she has worked as a writer, photographer and, most recently, on film projects.